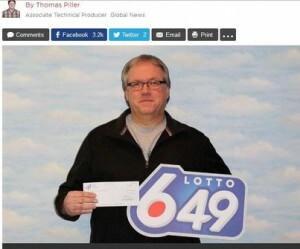 When lady luck finally came over to visit one Lotto 6/49 player, he had a very good reason to keep it quiet for a while; he did not want the win to divert attention from his daughter’s upcoming wedding. So Ken Frank waited two months before claiming his $1 million prize from the lottery. Frank bought the ticket from Humboldt Shoppers Drug Mart for the Oct. 15 Lotto 6-49 draw, and discovered the win the day after the draw. It took him four days to believe he had really won, then made the decision to wait. By now his family knows of his good fortune, and he has plans for traveling, home renovations and perhaps restoring a vehicle.